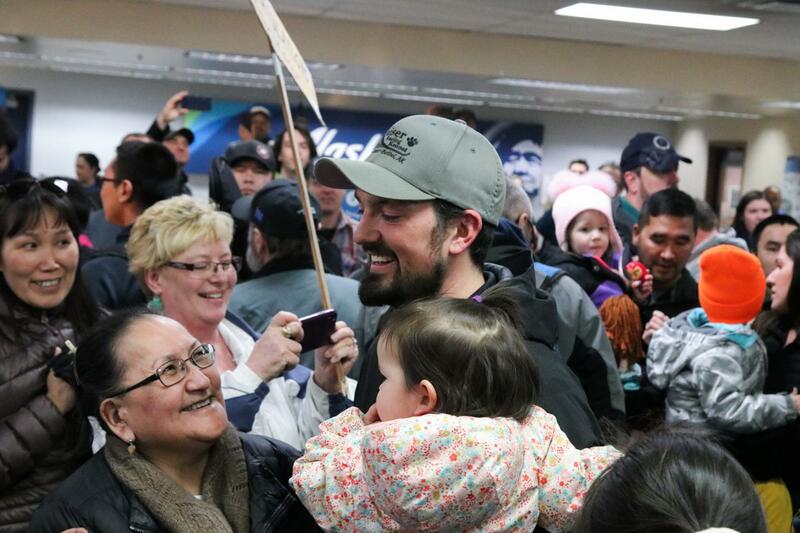 Musher Pete Kaiser greets fans at the Alaska Airlines terminal on March 18, 2019 in Bethel, Alaska after returning home from winning the 2019 Iditarod. Bethel has a new city holiday. March 13 is now “Pete Kaiser Day,” commemorating when the Bethel musher won this year’s Iditarod. “Pete’s success story proves that with passion and determination it is possible to achieve monumental things,” said council member Mitchell Forbes, reading from the proclamation declaring the holiday at Tuesday’s council meeting. The Iditarod and four-time Kuskokwim 300 champion himself was there to witness the declaration and stood up to speak to the sound of applause. Kaiser is the second Bethel resident to have a local holiday named after him. The first was the late Orutsararmiut Native Council Chief, Eddie Hoffman. Both local holidays are commemorative. Also at the meeting, council approved city administration pursuing federal funds to reconstruct three of Bethel’s most potholed roads. The city administration will nominate Akakeek Street, Ptarmigan Street, and Delapp Street for $1 million of federal funding and offer to match 14 percent of the cost. The match would come from the city’s general fund. The funding application would ask the Department of Transportation to dig out 3 to 4 feet of the road bed and start over with a new foundation. City Manager Pete Williams says that the city’s current solution is piling 6 inches of gravel on the roads, which rolls off and doesn’t fix the problem. It’s time, he says, for a new approach. “The road crew is just throwing good gravel. It just doesn’t hold together when it gets wet,” Williams said. The selected roads see heavy pedestrian traffic, and the proposal would include a 5-foot shoulder for foot traffic. Lastly, ALASKAbuds seeks to become Bethel's first retail marijuana shop. The proposed store would be located next to Stan's Barber Shop on 3rd Avenue. The owner has applied to the state Alcohol and Marijuana Control Office for a license to operate. The City of Bethel has until June 3 to protest the proposal. City council will review the application on May 14 at its regular meeting. Update: This story has been updated to clarify that "Pete Kaiser Day" is a commemorative date.